The last two seasons 2014 and 2015 have really been showing all the deer management for the pass six or seven years. My family has an amazing farm we hunt, but we let a lot of bucks walk. 2014 was a great season we saw a lot of deer and a lot of bucks... none that we thought were big enough. The first week of gun season 2014 I had a really close encounter with an 8-point the had a great four points on one side, but the other had a bunch of fly damage so I let him walk hoping he would make it through the rest of the season. My hopes came true and I saw him in January 2015 while hunting coyotes. I knew he would be a great buck to harvest in the fall of 2015. I put up my game cameras in the spring hoping to catch him on camera. I got we several different bucks on camera, but nothing I thought was him. When archery season started and I never hit the woods until the third week of October. When I did finally get in a stand I knew it was going to be a good season, there were deer all over. I hunted several different stands, always happy with what I saw. On November 7, 2015 I headed to the woods for a morning hunt. I got to the stand that I decided to hunt and sat there for a while until daylight. I saw a small buck go by, but something kept telling me that I needed to move to a different spot. So, at 7:15 am I climbed down and started walking up the edges of a power line. I was thinking to myself that I should get my climber and head to where I saw that 8-point with the one messed up side last season... so I did. By the time I got up in my climber it was 7:45 am. I got comfortable and said to myself, "Boy I like this spot." The wind was calm and cool about 40 degrees. Suddenly, I saw movement to my left about 75 yards out so I really watched closely. Next thing I knew, I was seeing nothing but antlers coming right at me. I grabbed my crossbow to be ready if it was a shooter. He got about 40 yards away and I knew I was gonna stick him with a bolt. I didn't know how many points he had... I just knew he was wide and tall. He came right in to 25 yards giving me a broadside shot. I put the crosshairs on him and "Whack!" and away he went... running like hell. Then I heard a big crash in the tree tops. It happened so quickly I didn't even get excited. I sat in my stand for a couple minutes thinking, "Did that really just happen?" I decided to climb down the tree. Once my feet hit the ground I started to feel the rush. I gathered all my stuff and walked over to were he had stood... I instantly found blood. I followed it for about 60 yards and there laid this awesome, wide racked, 11-point. 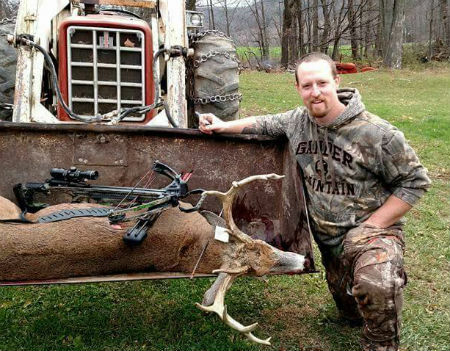 Bob's buck was taken in the Town of Bath in Steuben County. I called my wife, all excited, telling her I shot an awesome buck. I was so excited she kept telling me to just relax. I took a picture of him and sent it to all my family and friends. My phone was blowing up after that. I finally walked down to my truck and headed to the house. I got to the house, grabbed the tractor, and headed back on the hill to get my buck. Thankfully he died right next to one of our log roads, making easy work with the tractor. I put him in the bucket and drove back down to the farm to see a bunch of friends waiting to see the buck. We loaded him in my truck and went straight to Paul Daniels to have him scored. 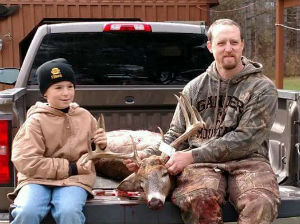 The buck gross scored 149-6 and netted 144-7. he dressed out at 202 lbs. Boy, was that a great 2015 archery season.